dude, you just made me want to type!!! Ooooh, that is a cool typeface! I too like the color of that Royal; did you repaint it, or was that hiding under the dust? I have far too many interests outside of typewriters. Motorcycles, martial arts, firearms, the outdoors, music, (obviously) writing, literature...just to name a few! It certainly makes for an interesting amalgam of collected objects and an eclectic library. I didn't repaint it. It just cleaned up good! People with more interests are more interesting I think. I doubt one can have too many. Royal have had some awesome typefaces on their machines. I'm half tempted to just collect typefaces, rather than typewriters! I like your typing spot too. Great spot! 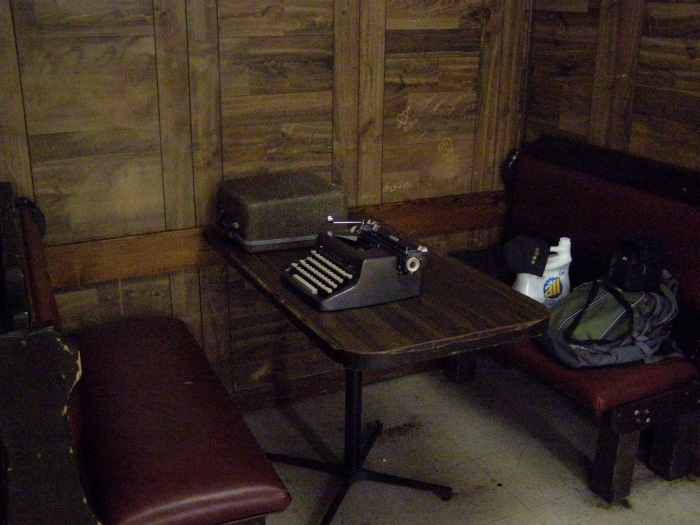 It looks like a cool place to type, but the table was rickety, it was very dark, and the laundromat was sketchy enough that at any moment a cloaked axe murderer might have walked in. But yes, those things aside it was a sweet place to type! OH.... I need to visit sometime. That really is a handsome finish on your QDL, I hadn't seen it (or maybe hadn't paid attention) before. I am aware of the typeface, though. 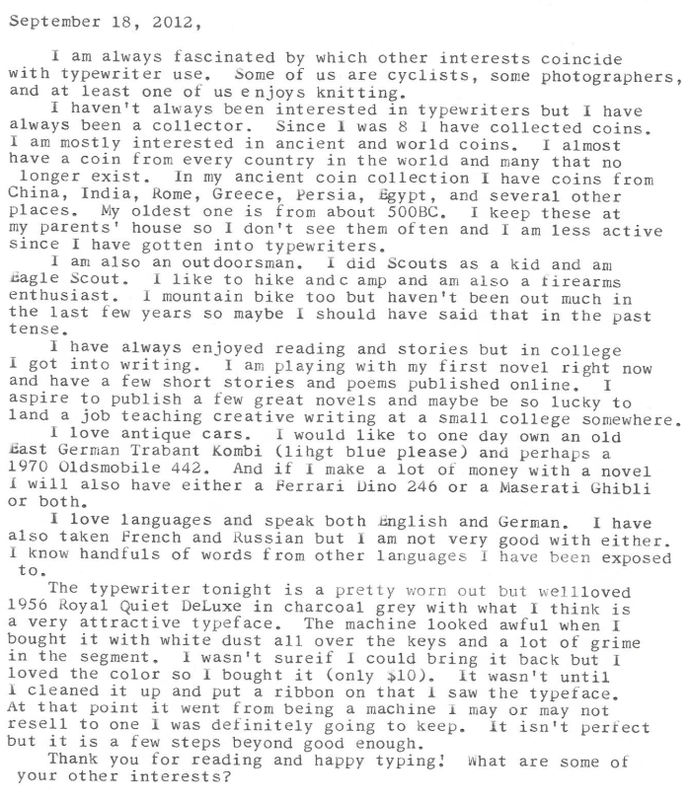 I made a font from it a while ago which you can download from my typewriter font page. Royal may have called it Windsor or Herald according to the list of Royal type styles that Rev. Munk posted, although to my eye it's not a perfect match for either. I had seen this color online somewhere once or twice and figured it was one of those things I wouldn't run across at a low enough price, then low and behold this little, junky looking typewriter popped up in a thrift shop in Ellicot City, MD. I was up there for a friend's wedding and the morning before we had some downtown so me and two other groomsmen went thrifting to find stuff with which to decorate the groom's car. 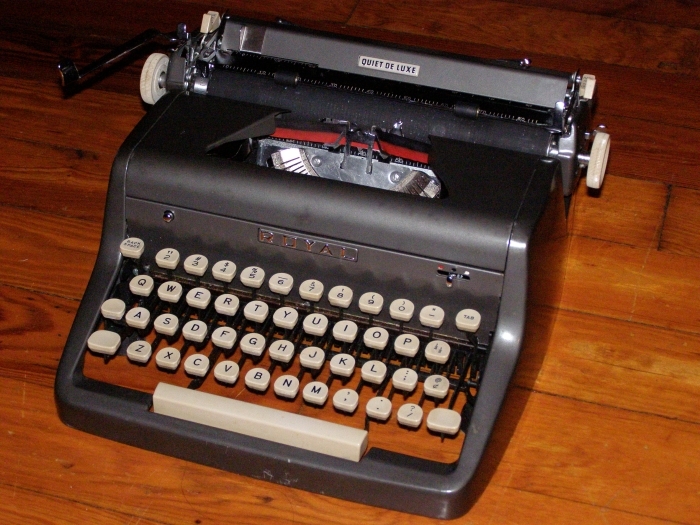 And I also happened to buy two typewriters, both QDLs, both made in 1956. I find the gray QDL very attractive. I don't think this variant is as commonly seen the red and teal. You're lucky to have snagged it and for peanuts! Typeface is nice and neat indeed. Wow, I never though the color was so rare but several of you seem to think it's uncommon. I love this machine more now. As sketchy as that place might have been, it looks like an awesome place to type. Plus, c'mon, you're an Eagle Scout! Some axe murderer wouldn't have anything on you, had you had time to Macgyver a weapon from that container of All. That is a really nice typeface. I, too, have bought machines only to later find, once a new ribbon is installed, what a nice typeface they had. Like the Hermes Ambassador I just bought. Sans Serif...aww yea. I, myself, like a nice, small typeface. But, whatever is eyecatching is worth it. I have a few neat ones, but nothing really special. Probably the best is my Facit TP1. Sans Serif, at a staggering 21-23 CPI!! My god, it is tiny. Thanks for sharing all of this. Your coin collection sounds intense. I never got into something like that, but from the way it sounds, you have quite an amazing collection going. Really neat stuff. I never guessed the Star Wars novels would actually be good. I'm not much of a Sci-Fi person but I'll keep my out for one in the thrift shop. That is a great typeface and I love that color. I've found the greatest typeface variety among Royal and Olympia machines. As for my personal interests, they are varied. In no particular order: photography, technology ephemera, anything space related, machines, cars of every description, robots, Japanese monsters and robots, typewriters, politics, sarcasm, Star Wars, Star Trek and science fiction in general. My list of knowledge areas and interests in the working world is equally long.